don’t think this is a recent piece of work – came across this on StumbleUpon this afternoon at work. retyped the campaign objectives and mechanics here so you could see how great the idea is. Consumers were skeptical about Unilever’s claim of “Confidence to remove stains in 1 wash”, so mailers and sampling activities were needed to prove to consumers that Breeze Excel actually delivered on its promise. 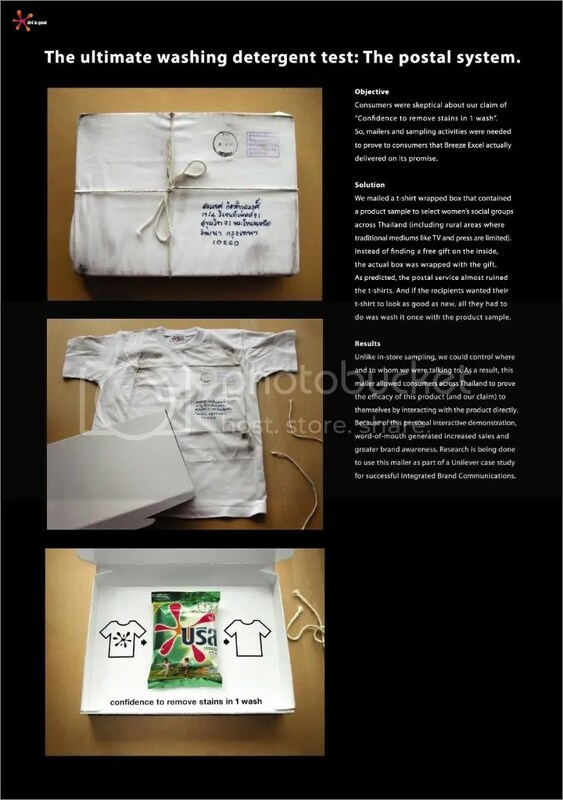 A T-shirt wrapped box that contained a product sample were sent to selected women social groups across Thailand (including rural areas where traditional mediums like TV and press are limited). Instead of finding a free gift on the inside, the actual box was wrapped within the gift. As predicted, the postal service almost ruined the t-shirts – making them really dirty and grimy. If the recipients wanted their t-shirt to look as good as new, all they had to do was to wash it once with the product sample. Unlike in-store sampling, Unilever could control where and to whom they were talking to. As a result, this mailer allowed consumers across Thailand to prove the efficacy of this product (and their claim) to themselves by interacting with the product directly. Because of this personal interactive demonstration, word-of-mouth generated increased sales and greater brand awareness. Research is being done to use this mailer as part of a Unilever case study for successful integrated brand communications.